Gold-Eagle (G-E) had the great pleasure and honor of interviewing Nick Barisheff recently. G-E: What is your overall Investment Outlook for 2015? Nick: I am seeing 2015 as a year of great volatility and uncertainty and there are many problem areas that could get dramatically worse. Unless something goes drastically wrong, like a Swiss currency issue out of the blue or something along those lines, I don’t think the gold price will do much until September, and will likely stay in the $1,100 to $1,300 range. If nothing dramatic happens, we will have volatility and uncertainty. The US equity markets are experiencing increasingly greater volatility. G-E: What asset classes are grossly over-valued? Nick: People are pouring money into the US equity markets instead of looking at traditional calculations like P/E ratios and earnings per share, both of which are manipulated by financial engineering. 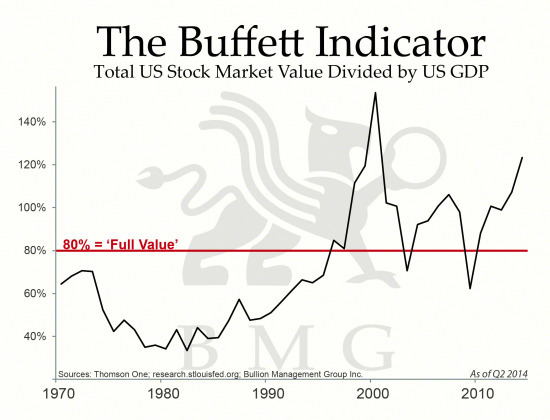 The Warren Buffet indicator is the telling one where the market cap of the S&P500 is divided by the US GDP. That indicator is rising and is compounded by the vulnerability of record high margin debt for stocks. G-E: What asset classes are considered today very inexpensive relative to historical standards and current global economic conditions? 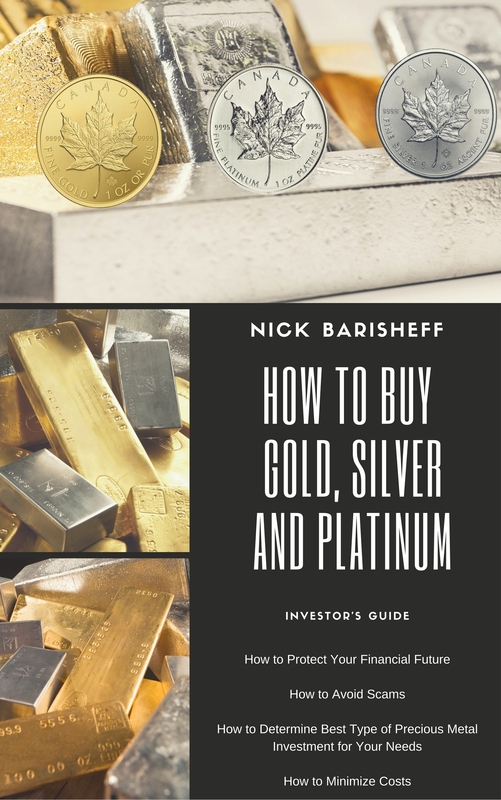 Nick: For the precious metals sector, gold, silver and platinum are very inexpensive today. Right now there is a rare anomaly where platinum is below the price of gold and silver is grossly undervalued with respect to gold. The silver/gold ratio is around 73:1. Based on the US geological survey of how much gold to silver is in the ground, there is sixteen times more silver than gold in the earth’s crust. Under the US Coinage Act when you had the bimetallism standard, it was 16:1. In 1980 the ratio was 16:1. If the ratio reverted to the mean it would be around 56:1. The prices are way out of line for silver and there is a depressed gold price. Platinum is grossly undervalued, silver is grossly undervalued relative to gold and gold is dramatically undervalued. Undervaluation brings us to the $10,000 per ounce gold figure. 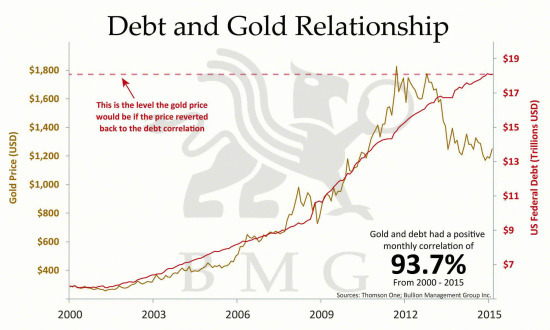 Until 2012, the US debt and the gold price had a positive correlation of 97%. 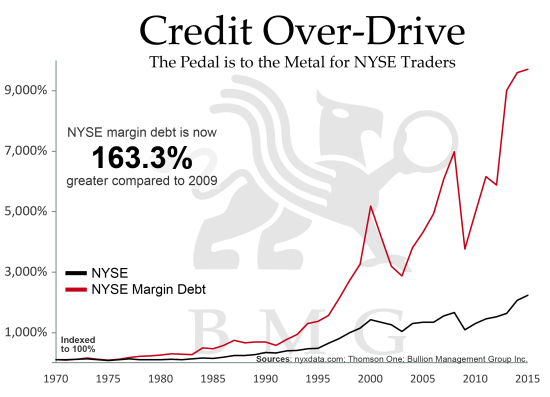 Then the figures diverge through manipulation, the gold price goes down and the US debt keeps rising. To get back to the correlated relationship that has been there for at least 20 years, the gold price would have to return to around $1,800. Gold is undervalued, silver is more undervalued and platinum is undervalued, so there is a lot of catching up to do. Instead of getting distracted by the manipulation, consider it a gift from the central banks. Right now gold, silver and platinum are all at a discount, so it is an ideal time to buy as much as you can. 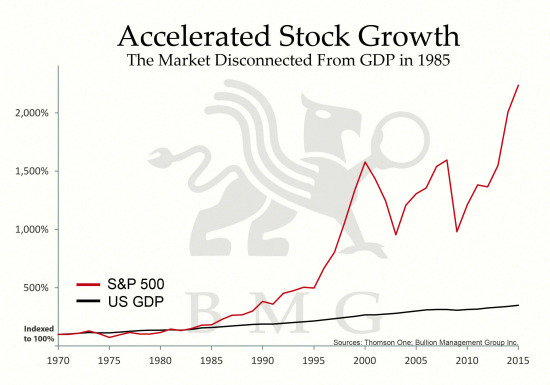 G-E: In light of the US Fed fueling US stocks via the levitating action of Quantitative Easing (QE), do you foresee an imminent crash in the S&P500 Index during 2015? And If so, what percent do you expect US equities to crash? Nick: This is a difficult question to answer because it is like saying that the markets can remain irrational longer than you can stay solvent. Whether the S&P500 crashes or not, there is no debate that the rest of the world is not growing, is in recession or maybe depression. There cannot be a US boom when no other country can afford to buy US goods. Sooner or later the high dollar works against the country from an export of products point of view. G-E: And if indeed US stocks commence a new secular Bear Market, where might prudent investors seek safe haven? Nick: No one disagrees that a balanced portfolio is the way to go. The issue is the lack of balance and diversification in traditional portfolios that only contain half of the asset classes and only contain the financial assets. In total there are 7 asset classes: currency, equities, fixed income, commodities, precious metals, real estate and collectables. Take collectables off the table unless you have expert knowledge, so let’s call it 6 classes. You need a balanced portfolio made up of those 6 and you need to keep rebalancing the assets back to a level that you’ve set, depending on your age and risk tolerance. The point is that to minimize volatility and improve returns over the long term, today you need at least 20% of your portfolio in gold. It’s not all or nothing; I’m not saying sell your equities and put 100% into gold. You are lucky if you didn’t have 20% of your portfolio in gold because we’re now at a low. There is an opportunity to correct the portfolio mistake and get to 20% in gold now, while the price is low. Because of what’s happened in the equities market, you will likely have too high a percentage of your portfolio in equities so take from there to rebalance back to a more realistic ratio of asset classes. For more information on rebalancing your portfolio with gold, we have an excellent video on our YouTube channel, and we can provide a customized risk and returns report for those who are interested (you can contact us via email at info@bmgbullion.com, or give us a call at 888.474.1001). G-E: As you well know, The Peoples Bank of China and Japan’s Central Bank are the world’s largest holders of US Treasuries. They own $1.3 TRILLION and $1.2 TRILLION, respectively. In your estimation do you feel the Peoples Bank of China and Japan’s Central Bank will soon awaken to the imminent FOREX danger this represents…and will subsequently dump Uncle Sam’s fiat paper to diversity their dire FOREX risks? And in the event The Peoples Bank of China and Japan’s Central Bank divest themselves of US Treasuries, might that cause a crash in the US Bond market…and a related crash in the value of the US greenback? Nick: The issue, as I understand it, is that the central banks of China and Japan are just monetizing new debt issues; they are not converting US dollars into treasuries anymore. They can’t really dump the paper, per say, by buying other currencies without causing a loss in their US holdings, but if they buy gold it has a much smaller affect in the FOREX markets. It would cause the gold price to go up, but wouldn’t cause the US dollar to go down. They wouldn’t be shooting themselves in the foot by pointlessly dumping US dollars into some other paper currency. Japan isn’t doing it, but China certainly is buying gold and they are buying it in a methodical way so the price is not suddenly forced up. Sooner or later we are probably going to lose control of the Fiat Monetary System and then we will have a problem. G-E: With regard to building cash in your own investment portfolio, are you in the same conservative boat as billionaire Warren Buffett who has amassed a cash position of over $55 BILLION (in anticipation of a stock market meltdown)? Nick: In terms of this cash position, Warren Buffet is holding $55 Billion of IOU’s. It is not money, it is a paper currency, and that can vaporize in a heartbeat. Over the centuries there have been many examples where fiat currencies have become worthless. There has never been a paper currency system that hasn’t ended in hyperinflation followed by complete collapse. When I talk about holding cash, which I recommend, I’m referring to holding precious metals as money, not a debt-based fiat currency. G-E: What is your opinion of the ramifications of Swiss National Bank’s unexpected decision to abandon the currency’s cap versus the euro…which drove one of the biggest shakeups in foreign-exchange history? Will the SNB decision cause the Euro currency to crash…i.e. thus paving the way for the eventual collapse of the Euro Union? Nick: There is a lot of back and forth with potential conspiracy theories on this topic, but when the Swiss pegged the Swiss Franc, they were buying Euros and that activity was indirectly supporting the Euro. Now that the EU is going to print Euros, they don’t need to support the Euro so the SNB is on its own. The problem is that, other than the 30 year bond, Swiss bonds have a negative yield. Bond purchasers have to pay the SNB to hold the bonds, which is bizarre. The 30 year bond is the only one that is slightly positive. There is an article by Keith Weiner about how totally unsustainable this practice is. A system cannot be run like that and we are into totally uncharted territory when there are negative yields for bonds. People are paying for the privilege of buying bonds but are better off buying gold. It would be more sensible to pay storage fees for precious metals than get negative interest rates on bonds. G-E: To date the only member of the Euro Union that has been living high on the hog so to speak (i.e. referring to the PIIGS) has been Germany. What might Germany do to salvage what it can? Nick: The powers that be are going to do everything possible to keep the Euro together, even if that means making a deal with Greece. They are going to fight tooth and nail to stop the EU from coming apart. The Germans will keep writing cheques and, in my view, it will ultimately collapse. The essential problem is that there is a currency union in Europe. While there is a currency union in Canada and a currency union in the US, they also include a political union and are made up of provinces and states. In Europe, the union is made up of countries; countries that have been at war with each other for thousands of years and have very disparate political views. Canadian provinces fall under the same rules, so we subsidize provinces like Quebec and the Maritimes back and forth, but the EU countries have a problem because they have long histories of conflict. There is a real movement in the US for a number of states to secede because they are saying the federal government is too big and is unmanageable and there is a provision in the constitution that allows them to secede once they have decided it is no longer working. For instance there is talk about California being so unmanageable that it needs to be four states rather than one and that is the essence of the problem of the EU with Germany at one end of the spectrum and Greece at the other. It is not just about the economy and money; it is about the work ethic and regulations. My barber is from Italy and he says that if you work for the government and you die, your great-grandchildren will keep getting your pension. How bizarre is that? This is an example of regulations that are not sustainable. 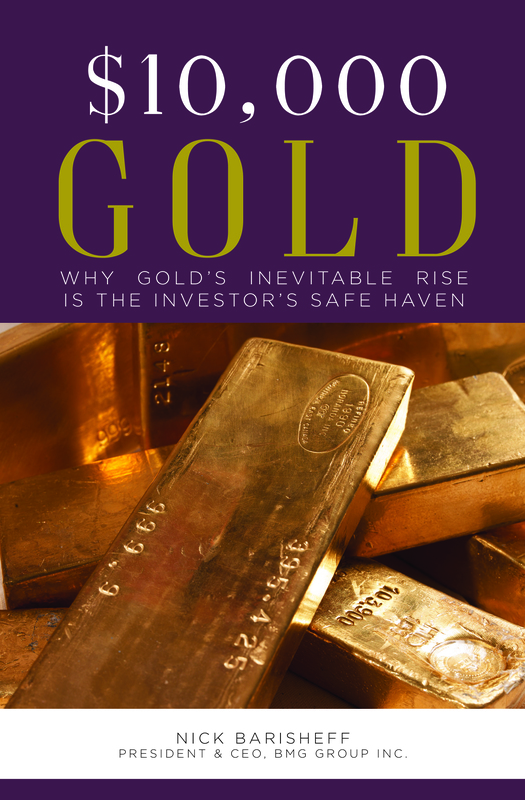 G-E: The title of your recent book is “$10,000 GOLD.” In what time frame and under what conditions do you believe we will see $10,000 gold? Nick: The projection comes down to correlation. The $10,000 figure comes from projecting the US debt. By the end of the Obama term, the US debt will likely be at $20 Trillion and gold should be at about $2,000 per ounce. If you carry on with that calculation, and if nothing goes wrong, you will get the US debt to correspond to $10,000 per ounce for gold, give or take five years. 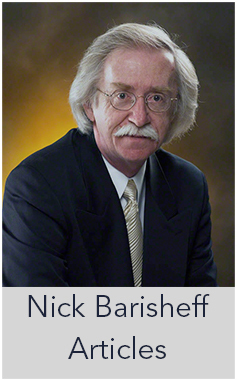 Gold-Eagle is very grateful to Nick Barisheff for taking the time to share his insightful and timely views during these volatile and uncertain times in all markets.